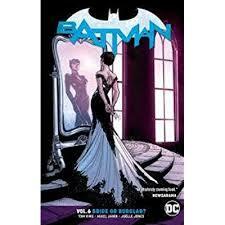 A collection of Batman stories focusing on different villains and cohorts. We get a glimpse of a young man with delusion being a master criminal, a picture of Batman and Wonder Woman falling in love while fighting a never-ending hoard of evil, Poison Ivy trying to control a broken world through love, and a continued look at the romance between Batman and Sabrina (nee Catwoman). For this reader who grew up during the Silver age of Batman, the stories are a bit hard to follow, but not completely off the wall either. I enjoy the modern, almost 3D, artwork coming from the current class of artists. Though the 2018 Batman may seem a bit darker than I remember from the late 50’s through the early 70’s, in some ways he better represents a truly broken character with real problems and hurts. We baby boomers need to learn to appreciate the new image of Batman, not as a super superhero, but as an ordinary man with super skills. This review is based on a free electronic copy provided by the publisher for the purpose of creating this review. The opinions are mine alone.